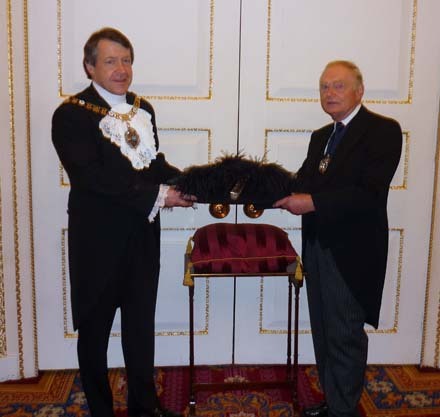 The Master and Wardens presented the Tricorn hat to the newly elected Lord Mayor, Alderman Roger Gifford, at the Mansion House on the Tuesday following the Lord Mayor’s Show. The Master gave a short speech congratulating the Lord Mayor and wishing him well for his tenure of office. The Master also presented the Lady Mayoress with a Feltmakers’ hat pin. 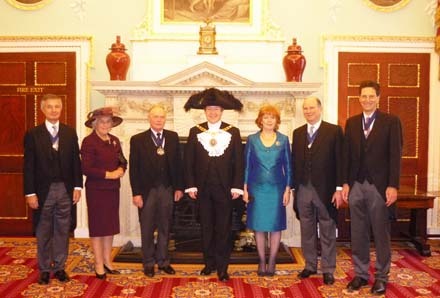 The presentation is one of the first meetings with Livery Companies in the Lord Mayor’s year of office and is an important event for the Feltmakers. The Lord Mayor first wears the Tricorn hat during the Silent Ceremony held in Guildhall on the Friday before the Lord Mayor’s Show. It is called Silent as there are no speeches. Upon admission to office, the incoming Lord Mayor puts on his new hat and the outgoing Lord Mayor then removes his hat which had been presented to him the previous year. The Lord Mayor wears the Tricorn hat during the Lord Mayor’s Show and can be seen waving it at the crowds and the floats as they pass by in the parade. The Tricorn hat is made by hand for our Company by Patey of London specifically for each Lord Mayor. It is black and made from wool with black ostrich feathers. The Lord Mayor keeps the hat following his year of office.